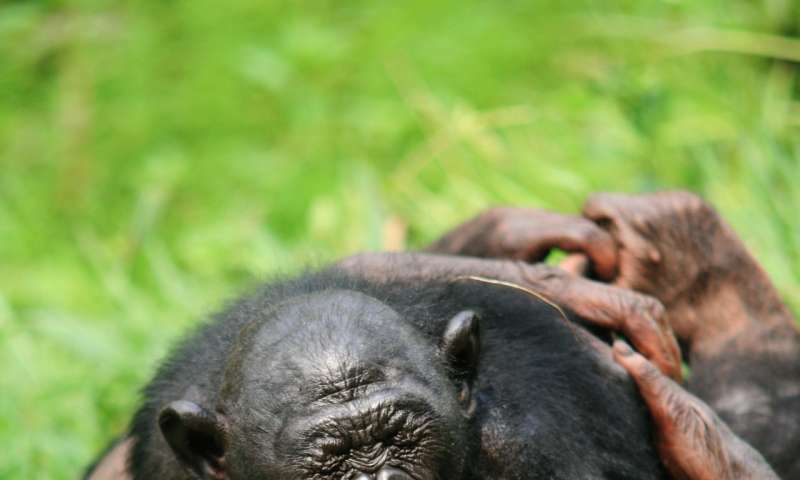 Close primate cousins with whom we share 99 percent of our DNA, bonobos will help strangers even when there is no immediate payback, and without having to be asked first. Credit: Lola ya Bonobo Sanctuary. A passer-by drops something and you spring to pick it up. Or maybe you hold the door for someone behind you. Such acts of kindness to strangers were long thought to be unique to humans, but recent research on bonobos suggests our species is not as exceptional in this regard as we like to think. 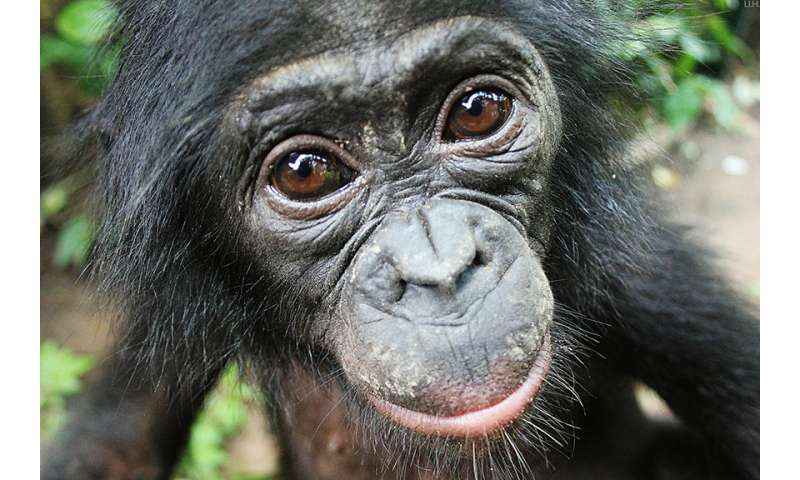 Famously friendly apes from Africa's Congo Basin, bonobos will go out of their way to help strangers too, said Jingzhi Tan, a postdoctoral associate in evolutionary anthropology at Duke University. A previous study by Tan and associate professor of evolutionary anthropology Brian Hare found that bonobos share food with strangers. Now, in a new series of experiments, the team is trying to find out just how far this kindness goes. The researchers studied wild-born bonobos at the Lola ya Bonobo sanctuary in the Democratic Republic of Congo. In one experiment, they found that bonobos will help a stranger get food even when there is no immediate payback. Sixteen bonobos were led one at a time into one of two adjacent rooms separated by a fence. The researchers hung a piece of apple from a rope just above the empty room, visible but out of reach. The apes couldn't access the fruit or the rope. But if they climbed the fence they could reach a wooden pin holding the rope to the ceiling and release the dangling fruit, causing it to drop within reach of any bonobo that entered the next room. The bonobos released the fruit roughly four times more often when an unfamiliar bonobo was in the adjacent room than when the room was empty. What's more, the bonobos didn't wait to be asked for help, they just offered it. The researchers changed the size of the mesh surrounding the stranger's room so that in some trials they were able to stick their arms through the openings in the screen to beg for the treat, and in other trials they were not. The bonobos helped just as often whether the stranger gestured for help or not. Bonobos' impulse to feel for strangers isn't entirely under conscious control, the researchers also found. In another experiment, they had 21 bonobos watch a series of short videos. In some videos, the apes saw a familiar group member either yawning or making a neutral expression. In other videos they watched complete strangers from the Columbus Zoo in the U.S. behaving the same way. Just as watching another person yawn can make you yawn, yawning is contagious in bonobos too. Previous studies suggest the phenomenon is linked to a basic form of empathy called "emotional contagion," when one person's mood triggers similar emotions in others around them. The researchers found that stranger yawns were just as contagious as those of groupmates. The impulse to be nice to strangers is likely to evolve in species where the benefits of bonding with outsiders outweigh the costs, said Tan, now a postdoctoral scholar at the University California, San Diego. Female bonobos leave the group where they were born to join a new group when they reach adulthood, where they form bonds with other unrelated adults they've never met. Bonobos, like humans, may simply be eager to make a good first impression. "All relationships start between two strangers," Tan said. "You meet a stranger, but you may meet them again, and this individual could become your future friend or ally. You want to be nice to someone who's going to be important for you." More proof of my pet theory: Humans are the selfish, unruly, and destructive descendants of prehistoric primates. Due to bad behavior, our ancestors were outcast from the tree tops by their socially cohesive arboreal relatives. And just as many of us now look to up to the sky in supplication, so did our ancestors as they relied on the largess of their tree dwelling benefactors for food until the point at which they could adapt their diets to terrestrial food sources. We are the mongrel result of a primate penal colony. Yes, this just a fun joke. Don't blame me if you start seeing evidence for it in every primate study you see from now on. We are more likely descended from chimpanzees who are cannibalistic and primate eating carnivores. We out-evolved other hominids by killing them or eating them. There is a HUGE advantage of integrating into a successful group, but it comes at an evolutionary cost. For most of us that cost is being fundamentally altered such that we are predisposed to help the group and the individuals it contains, not only without being asked, but even without thinking about it. Apparently, the same evolutionary forces have been at work on the bonobos. Most of us have been so altered by the evolutionary process that it is abnormal to not feel good to help one another. These feelings go well beyond even our own species. Most of us feel good when we protect our pets and even wild animals and plants. I saw a video of divers removing an entangled fishing net that was slowly cutting into a whale's flesh and it was absolutely wonderful to see the whale freed from the net by divers who were actually risking their lives. We should embrace this part of our nature as real and necessary and even ennobling. It may be critical to facing the challenges ahead. The evolutionary effects of group living also neatly explain religion. Speaking about the religion I know best, Christianity, if you are within the group, you are nominally a brother or sister to be treated with kindness and respect. If you are outside the group, Christianity is flexible enough to allow you in if you are willing. If you challenge the group, you are going to be confronted by a united group who believes the group must be preserved at all costs. All cultures seem to have a religion of one sort or another, and you can see that flexible religion like Christianity is extremely useful for promoting interest of the group above others. 'unrelated adults'. Unless these adults are from another planet, this isn't likely. Your article on bonobos refers to them as 'apes' awfully frequently, given how little your articles on humans do.